Paris, 1878. Following their father’s sudden death, the Van Goethem sisters find their lives upended. Without his wages, and with the small amount their laundress mother earns disappearing into the absinthe bottle, eviction from their lodgings seems imminent. With few options for work, Marie is dispatched to the Paris Opera, where for a scant seventeen francs a week, she will be trained to enter the famous Ballet. Her older sister, Antoinette, finds work as an extra in a stage adaptation of Émile Zola’s naturalist masterpiece L’Assommoir. Marie throws herself into dance and is soon modelling in the studio of Edgar Degas, where her image will forever be immortalized as Little Dancer Aged 14. Meanwhile, Antoinette, derailed by her love for the dangerous Émile Abadie, must choose between honest labour and the more profitable avenues open to a young woman of the Parisian demimonde. 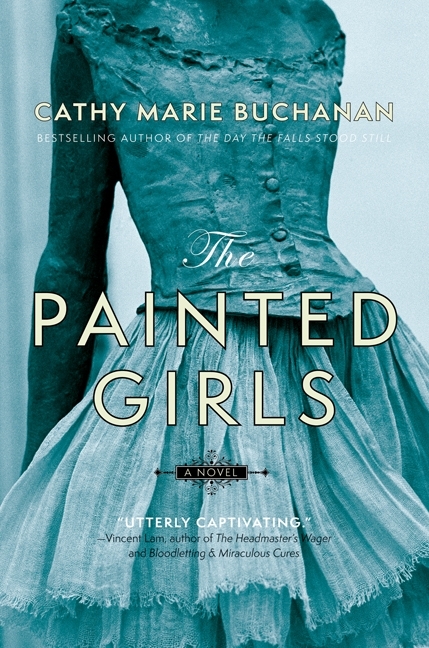 Set at a moment of profound artistic, cultural and societal change, The Painted Girls is a tale of two remarkable sisters rendered uniquely vulnerable to the darker impulses of “civilized society.” In the end, each will come to realize that her salvation—her survival, even—lies with the other. The Painted Girls is a heartfelt and absorbing story about three sisters coming of age after their father’s untimely death. Set against a backdrop of Paris in the 1880’s, the alternating narrative between Antoinette and Marie portrays the girls as they struggle to find scraps of food, pay the rent and keep warm while minding their alcoholic mother and younger sister. The Painted Girls explores the art and ballet scene at the time as well as a string historical string of murders, expertly weaving fact with fiction. Part social commentary on the era, part a heartfelt story of sisters, this novel is a delight to read. Buchanan’s prose is absorbing, stunning and incredibly vivid. I felt like I was standing on the streets of Paris along with the characters and never once did the description bog down the story. Every detail fit and flowed within the confines of each scene from the small room they all live in, to ripping off another cupboard door for fuel and the rigour and agony of the ballet training. The story itself is mesmerizing. Admittedly, I wasn’t aware of The Little Dancer Aged Fourteen, nor any of the story surrounding it, and I really appreciated learning all that I did with this novel, including the strife and hardship dancers go through, particularly during that time. At times this novel shocked and saddened me- particularly how young women were treated and I had to continuously remind myself how young these two girls were because their journey contained much that no adult should ever have to experience. But I was still grateful for having picked up the novel regardless of how hard some scenes were to read. As I wrapped up the final pages, for the first time in my life I found myself really missing having had a sister. And it wasn’t just that I wished for one, I actually ached for one. Not that I would trade in my two brothers, but that’s how much this novel made me feel. The relationship between the three girls was portrayed marvellously, and I’m certain that anyone that has a sister will cherish The Painted Girls even more. Pick this one up today! This is a gripping and well-researched piece of historical fiction. Francophiles, balletomanes and modern art fans are sure to enjoy it, for it crosses all of these areas of interest.